and its Nar Marratum, "Bitter River,"
Please click here for an earlier article on the Nar Marratum Map. 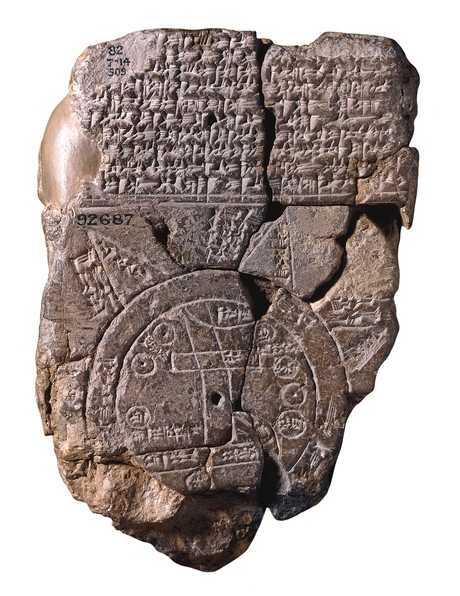 On 20 October 2009 while studying various maps of Iraq from the 19th through 20th century A.D. on the internet I stumbled across an "interpretative" drawing of the famous "Babylonian World Map" which may date to the 6th century B.C. (The Persian Period, when Persia bore rule over Babylonia after 539 BC). 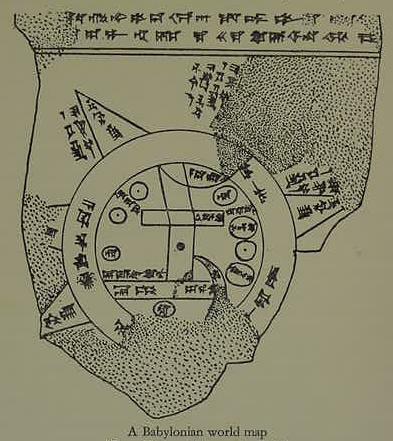 Upon a careful study of this map it struck me that professional PhD scholars were "perhaps" _wrong_ in their interpretation of the features on this ancient clay tablet. 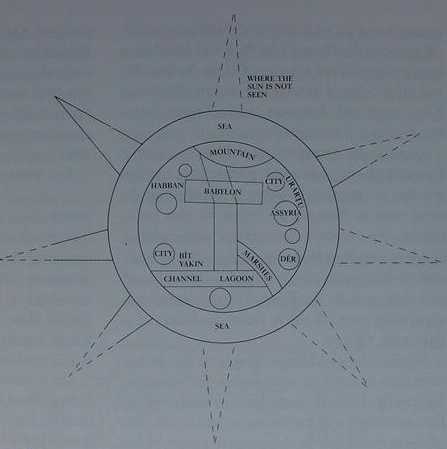 The Babylonian "World Map" map is highly schematized: A double circle surrounds Babylon which appears on a rectangle in the center. This circle is labeled in cuneiform the Nar Marratum, translated to mean nar= "river," (Arabic: nahr= "river") marratum= "bitter" (Arabic: marah, myrrh, merra, murr, murrat also mean "bitter"). The usual scholarly explanation is that this Circle-River is being called "bitter" because it represents the Cosmic Ocean surrounding the earth which possesses bitter saltwater. Hence the reason why some scholars alternately render the "Bitter River" rather freely, the "Bitter Sea." Surrounding the Circle-River ("Bitter River/Bitter Sea," or "Cosmic-River-Ocean") are several triangles, sometimes interpreted as being "islands" beyond the "Bitter Sea/Ocean" which encircles the land/world of Babylonia. Several small ovals ringing Babylon within the Nar Marratum have been identified as being cities. To the SE of Babylon appears Deri, to the NE of Babylon is Asshur and Armenia, to the NW of Babylon is Habban and to the SW of Babylon is Bit-Ya'kin ( bit= "house" or "tribe" of Ya'kin" or Ja'kin). Modern scholarly maps today place the region of Bit-Ya'kin (Bit-Jakin) as SE of Babylon and E of the city of Ur and W of the Hor al Hammar Lagoon in Lower Mesopotamia (modern Iraq). (2) I _agree_ that Babylon is shown as being on a river extending from the top to the bottom of the ring-circle river or Nar Marratum. (3) I _agree_ that the Ring-Circle is labeled the Nar Marratum. (4) I _agree_ that Asshur is the city of Asshur in Assyria. (5) I _agree_ that Armenia is the mountainolus area of Eastern Turkey. It is my understanding that PhD scholars (Assyriologists) have for over 100 years (since 1881) _misunderstood_ "some" of the features appearing on the Babylonian "World Map," and that this moniker is a mislabeling of the map based on the mistaken notion that the Bitter River is a "Saltwater-Cosmic-Ocean-Stream" encircling the known world of the Babylonians. Some scholars tend to suggest that the following bodies of water are "embraced" by the Nar Marratum: (1) The Persian Gulf or "the Lower Sea (2) the Mediterranean Sea or "the Upper Sea." Some suggest perhaps the northern part of the Nar Marratum includes the Black Sea and or Caspian Sea. In opposition to 100 years of professional PhD scholarship I understand that the Nar Marratum, "Bitter River" encircling Babylon is intended to represent the Tigris and Euphrates Rivers which "encircle" Babylonia, Akkad and Sumer. East Sector of the Ring-Circle: May be that portion of the Tigris River called on modern maps the Shatt al-Amarah extending north from Qurnah to the city of al-Amarah and continuing WNW to the Kut al-Amarah due east of Babylon/Hillah. North Sector of the Ring-Circle: The mountains N of Asshur (the city of Asshur on the Tigris) and Armenia (Armenia in eastern Turkey) are where the Tigris and Euphrates begin at their sources, completing the northern Ring-Circle. West Sector of the Ring-Circle: Descending from the mountains of Armenia to the vicinity of Habban and Falluja thence descending _to the west_ of Babylon (this western sector of the Nar Marratum includes perhaps the ancient Abgal or Pallukatu canal from Falluja which might preserve Pallukatu?). This stream descends further to the S from Hor al-Habbaniyah to Bahr al-Milh, thence SE to the Bahr Nedjef and its marshes, thence SE to as-Samawa/Samaua. This completes the western part of the River-Circle. South Sector of the Ring-Circle: From the Bahr Nedjif and its marshes to as-Samaua and an-Nasiriya and the Hor al Hammar Lagoon and its marshes, the circle completes its self at al Qurnah. ESE of Babylon is Deri, which I propose might be Kalaat Deraji (1897 map ruin or tell site), alternately rendered Durraji (1922 map)? It might also be further E in the locality of ad-Dair between Qurna and Basra on the W bank of the Shatt al Arab? ENE of Babylon, and _within_ the Circle-River is the Assyrian city of Asshur which lies _within_ the Nar Marratum, on the west bank of the Tigris. WNW of Babylon the city of Habban/Khabban may perhaps be identified with al-Habbaniya and its nearby lake called Hor al-Habbaniyah, W of Baghdad. I understand that Ring-Circle Nar Marattum has its name preserved today in the Shatt al-Amarah due E of Babylon/Hillah which runs to the SE from Kut al-Amarah to the city of al-Amarah north of al Qurna. The Shatt al-Amarah was probably in antiquity the "border" between Babylonia and Elam (Elam being to the east of this stream). The Tigris/Shatt al Amarah is _not_ a "bitter river," so the river apparently (?) took its name in antiquity from perhaps the site of Al Amarah, north of Qurna? Neo-Assyrian texts (circa 694 BC) mentioning battles or engagements and the pursual of defeated enemies "across the Bitter River" may be referring to the Shatt al Amarah being crossed by fleeing marsh dwellers seeking sanctuary in Elam whose plain extends to the eastside of the Shatt al-Amarah. Bit Ya'kin is, in my opinion _incorrectly_ located on _all_ PhD scholarly maps. These maps show Bit Ya'kin as SE of Babylon, and E of Ur and W of the Hor al Hammar Lagoon. Why do I understand this is "wrong"? The Babylonian World map reveals a river extending south of Babylon to connect at the Nar Marratum Ring-Circle. I understand this river is the Shatt al Hillah and that Bit-Yakin on this map is to the W of this river, _not_ to the E of the river. I "suspect" but cannot "prove," that Bit-Ya'kin "may be" (?) preserved in two Arabic names: (1) Tell Khanasar; and (2) the Shatt el Alkhan, a stream near Tell Khanasar flowing SE from the Bahr Nedjef towards es-Samaua. That is to say Bit-Ya'kin is _within_ the SW sector of the Bitter River circle map, _not_ the SE sector of the map where scholars for over 100 years have located it. 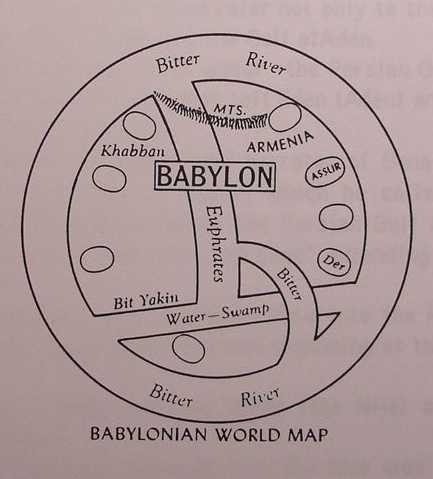 The Babylonian clay tablet map shows a stream/river extending south from Babylon to the ring-circle river, bisecting a river labeled "water stream marsh." Maps of the 19th century reveal a great marsh once existed from Bahr Nedjef to Samaua, thence past Uruk's south side to Ur and thence to the Hor al Hammar east of an-Nasiriyah. I understand this clay tablet's "water stream marsh" is this area from the Bahr Nedjef to Samaua and the marshes of the Hor al Hammar and nearby Qurnah. I understand that the river (two lines) extending south of the city of Babylon (Babylon is the rectangle) is the Hilla/Euphrates channel on modern maps, it bisects the marsh river (Euphrates) going W to E from Nedjef to Nasiriyah at as-Samaua. 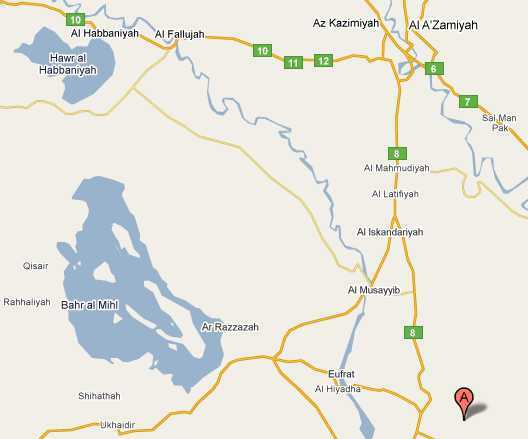 Habban might be the town of al Habbaniyah W of Baghdad? Asshur is perhaps the city (the nearby oval being a city) of Asshur on the Tigris River (in the Nar Marratum's northern sector). The mountains north of Habban/Khabban and Armenia may be the Armenian mountains of eastern Turkey and the "source" of the Euphrates and Tigris (the Nar Marratum), and, as these two rivers have their origins "near" each other, this completes the northern circle of the Euphrates/Tigris Circle-River. The maps shows the Euphrates stream Babylon is on as originating from the mountains north of Asshur and Armenia. Deri (Der) might be Kalaat Daraji SE of Babylon and near the Euphrates E of Samaua and W of Nasiriyah. It too lies _inside_ the Ring-Circle of the Nar Marratum (Others suggest Der, near Elam, south of Asshur, but this Der is E of the Tigris, not W of the river as on the Babylonian Map). 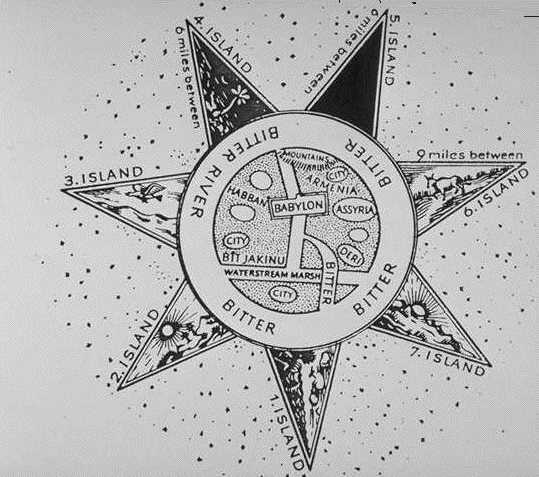 The triangles are sometimes referred to as "islands" as scholars understand that a world encircling Cosmic Ocean is being portrayed as the Nar Marratum. I disagree. I understand that the triangles are intended to be mountains. The High Plateau of the deserts on the W and S might be the "mountains" (foothills) in this area which trap the Euphrates' waters into depressions creating wadies and seasonal Sebkhas or Lakes extending from Habbaniyah southwards to Bahr Nedjef thence to Samaua and Nasiriyah (The ancient Abgal later Pallukkatu canal from Falluja above Sippar being the westernmost branch of the Euphrates (the western sector of the Ring-Circle Nar Marratum, west of Babylon)..
"The Babylonian Map of the World and the bilingual Creation of the World by Marduk demonstrate that the Babylonians, at least, believed that a cosmic ocean encircled the continental portion of the earth's surface. The most familiar parts of this ocean were the Upper Sea (Mediterranean) and the Lower Sea (Persian Gulf, Indian Ocean), but it is clear from the World Map that the cosmic ocean was also believed to flow to the east of Babylonia beyond Iran, and to the mountains of modern Turkey. The tradition of a northern part of the ocean may have been influenced in part by the vague knowledge of the Black and Caspian Seas." Regretably, Kraeling does not offer an explanation for the site of "Armenia" appearing on his Babylonian World Map. The "first" appearance of Armenia in an ancient text that can be securely dated is of the 6th century BC (circa 520 BC) Persian King Darius II who mentions Armina as part of his empire in the Behistun rockface inscription in present day Iran. "Armenia, a KJV translation of the Septuagint's Armenia in 2 Kings 19:37; Isaiah 37:38 (RSV Ararat). This is a later name of Urartu-Ararat. The name Armenia (Armina) first occurs in the inscriptions at Behistun (section 6)." "Despite the absence of a name, it is clear that the parallel lines running to and from Babylon represent the river Euphrates. To the right of Babylon an oval marks Assyria, and above it is apparently Urartu (Armenia). Several other cities are marked by small circles; one near the trumpet-shaped sea, named "Fort of the God," is probably Der (Badrah) at the foot of the Zagros Mountains. The name Khabban to the upper left appears to denote an area of Elam southeast of the Zagros, geographically out of place (it might be another town of the same name otherwise unknown)." "If" I am "right" that the Nar Marratum is the Euphrates and Tigris from its origins in the mountains of Armenia to its end in the swamps extending from the Bahr Nedjef to the Hor al Hammar Lagoon and marshes, and, "_if_"my site proposals are "on the mark," a rewriting of texts on the Geography of Neo-Assyrian and Neo-Babylonian Eras (The 9th-6th centuries BC) may be in store for the future as most scholars "think" _incorrectly_, in my opinion, that Bit-Yakin (Bit-Jakin) is SE of Babylon _contra_ the Babylonian World Map's placing this region to the SW of Babylon. A whole "slew" of new sites may await (?) the archaeologist's spades as they uncover the "missing world" of the Chaldean Tribes of the Bit Yakin (Bit-Jakin), Bit-Dakkuri, Bit-Snilani, Bit-Shilani, Bit-Amukkani, Bit-Adini, Bit-Saala and their capitals and villages in the marshes SW of Babylon. That is to say the Neo-Assyrian's Kaldi (Chaldeans) may have been very close to Babylon "if" they inhabitated the marshes and swamps in the SW sector below Babylon. Has this SW sector been subjected yet to a thorough archaeological search for sites of the 9th-6th centuries BC when they appear in Neo-Assyrian records? I note from my personal study of archaeological sites appearing in Roaf's Atlas of Mesopotamia (1990) that he shows practically _no_ ancient sites in the sector SW of Babylon, almost all his sites are to the SE of Babylon (cf. Michael Roaf. Cultural Atlas of Mesopotamia and the Ancient Near East. New York. Facts on File. 1990). Neo-Assyrian texts of the 9th-7th centuries BC speak of their victories in Lower Mesopotamia and that their enemies flee their marsh hideouts to across "the Bitter River" to Elam. This suggests for me that the "Bitter River" is the Tigris as the Shatt al-Amarah (apparently Elam's western border). It makes "no sense," to me, for the defeated marshland foes to be crossing a "Cosmic Ocean" to get to Elam! An eastern triangle the Babylonian World Map is described where the sun rises. This makes sense if the triangle is the Zagros mountain range where the sun would rise for someone viewing it from the Babylonian plain. Between Babylon and this mountian range that the sun shines from is the Tigris as the Shatt al-Amarah, the "Bitter River" or Nar Marratum, not a Cosmic Ocean-River. The Babylonian World Map does not have a Tamtu Marratum ("Bitter Sea") between Babylon and the sunrise mountain triangle of the east, its a Nar Marratum, a "bitter river," (the Shatt al-Amarah). A Triangle to the north is described as a region being in darkness. As the sun rises in the east it moves southward to set in the west, the north side of a house would witness darkness or no sunshine. So the northern mountains (triangles) beyond the Nar Marratum are in darkness on their northern sides. Again, the Tigris and Euphrates are south of these mountains and the Nar Marratum Circle-River is also south of these triangle mountains. The word for "sea" was usually tamtu, not nar. Nar means "river" and the only _"nar"_ between Babylon and the triangle mountain to the east of Babylon is the Nar Marratum, the Shatt al-Amarah (Tigris), a Cosmic Ocean-River or tamtu does not exist between Babylon and the Zagros mountain range where the sun rises. If the Babylonian World Map's Habban/Khabban is modern al Habbaniya NW of Babylon-Hilla, then the presence of Armenia (The Persian King Darius II's "Armina" of ca. 522 BC) would appear to date this map to 6th century BC, the early Persian period, sometime after 539 BC and the capture of Babylon by Cyrus and the rule over the city and its region, Babylonia and Assyria, by his successors. The Nar Marratum map, _for me_, is concerned to show "the full extent" of the two major rivers that watered Assyria and Babylonia, from their origins in the mountains of Armenia to their eventual dissipation in the marshes of Lower Mesopotamia, "the water-stream-marsh or water-swamp or channel-lagoon" extending from the vicinity of Bahr Nedef and its marshes to the Hor al Hammar marshes near Qurna. This map, for me, is _not_ about a "Cosmic Ocean" encircling the World, the Persians would have "known better;" they knew of Egypt, Canaan, Phoenicia, Syria, the Greeks of Asia Minor, Elam, Media and their own country of Persia, yet these nations do not appear. This map's concern, apparently, was to plot the Tigris' and Euphrates' beginning in the mountains of Armenia, its encirclement of Assyria and Babylonia, and its end in the marshes extending from Nedjef to Qurna, which it does, remarkably well. Below, a map showing the settlement of al Habbaniyah and a nearby lake created by the Euphrates river called Hawr al Habbaniyah. The location of the ancient city of Babylon is marked by a red dot. Compare the relative position of Habban/Khabban on the 6th century BC Babylonian World Map with modern Habbaniyah. 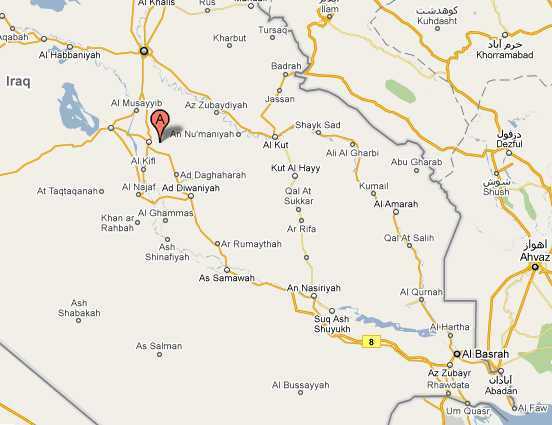 Habbaniyah appears to be in the same relative location to the WNW of ancient Babylon as the World Map's Habban/Khabban. If I am "right" that Habbaniyah is Habban of the 6th century BC world map, then the Bitter River near the site is probably the Euphrates not a Cosmic World Ocean River embracing the Persian Gulf, Caspian, Mediterranean, and Black Seas as proposed by PhD scholars for the past 100 years. Below, a map showing Babylon as a red dot encircled by the Euphrates and Tigris Rivers as portrayed on the 6th century BC Nar Marratum World Map. 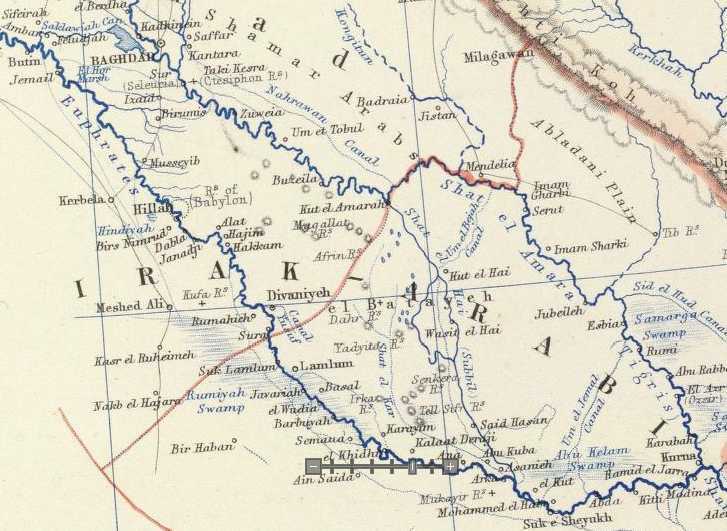 I understand that Nar Marratum (nar= river, marratum= bitter) is preserved in Arabic today at Al Amarah on the Tigris River and also at Al Kut, N of Al Amarah (more properly Al Kut is actually called in Arabic Al Kut Al Amarah). The Nar Marratum's Habban/Khabban I understand to be preserved in Arabic at Al Habbaniyah ENE of Babylon (Red Dot). The modern highway encircling ancient Babylonia follows the courses of the Tigris and Euphrates rivers which encircle Babylon like the Nar Marratum. "Khabban or Bit Khabban is also named, but its exact location is not yet known and references to it are scarce in the Babylonian texts." "Habban, the homeland of a Kassite tribal group from Iran, is placed (wrongly) to the west of Babylon." Shat el Amara because Neo-Assyrian annals circa 694 BC mention marsh dwellers fleeing Assyrian warriors by crossing the Nar Marratum/Bitter River to seek refuge in Elam and Elam is east of the Shat el Amara river (Map of "Turkey in Asia: Transcaucasia." The Royal Atlas of Modern Geography. Edinburgh & London. William Blackwood & Sons. 1861).